We are pleased to announce the release of Analytics Canvas V3.0, featuring Analytics Canvas Cloud Automation! This latest release takes us far above the desktop and into the cloud. 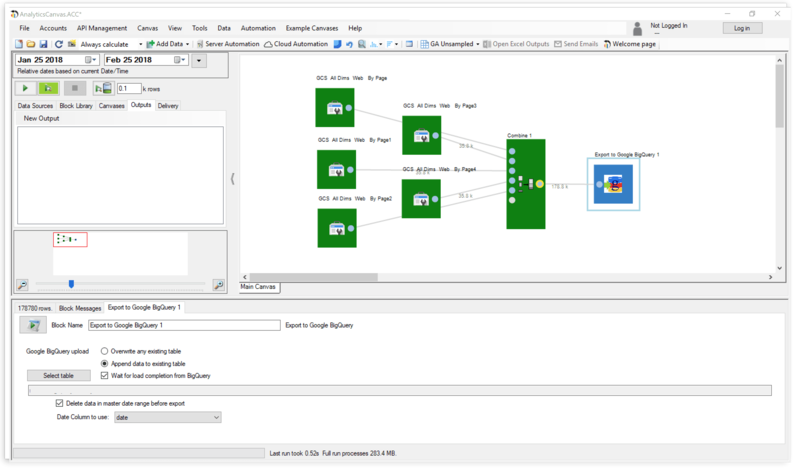 No need for servers or additional hardware – automating a data workflow is as easy as publishing the file from your desktop to our cloud. Best of all? The Megabyte level of Cloud Services is included free in all of our plans! That means EVERYONE now has the ability to automate their routine data tasks and can do so within minutes. That’s right, every Analytics Canvas customer can now run up to 150 automation packages each month included with their subscription. And with upgrades available starting from just $99/mo, customers can process gigabytes, even terabytes of data each month, running concurrent packages as frequently as every 10 minutes! Learn more about the new Cloud pricing tiers. 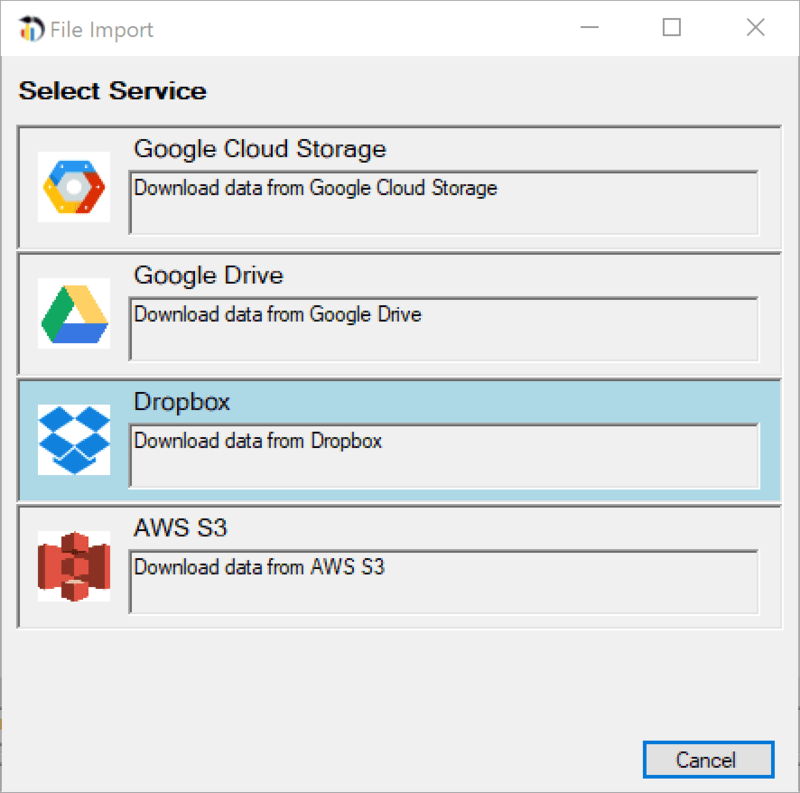 Also new in this release is the ability to import data and export files to secure cloud file sharing and storage services including Google Drive, Google Cloud Storage, Dropbox, and Amazon S3. This gives you more ways to get data into your reporting processes and to deliver the dashboards and reports created in Canvas. Data files can be pulled into a Canvas from one or more services, and any file created by Canvas can be delivered to one or more cloud file sharing services. This connector lets you get data from anywhere Canvas connects to, blend it, merge it, fix it and then deliver it directly into Data Studio for fantastic looking reports and dashboards. Combined with Cloud Automation, your Data Studio reports can be refreshed frequently throughout the day. 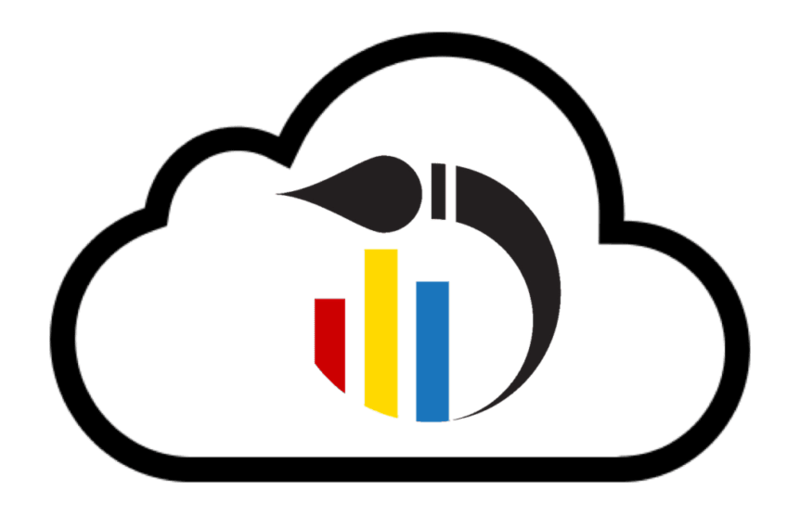 Learn more about getting your data prepared and published into Google Data Studio. Our new Search Console connector lets you query from multiple sites at once and get the results together into a single table. Export results to your database to capture and store more than 18 months of Search Console history, or process the data using Canvas and publish your dashboards daily. No python scripts or Github repos required – point and click your way to ALL of your Search Console data. Just for fun we packed a few more features into this release that our customers have been asking for and made sure that you can use them all together with our Cloud Automation service. New Tableau .hyper extract export allows you to create larger extracts that generate faster and offer better performance on Tableau Desktop, Online, and Server. Performing an incremental load to your database tables has never been easier. Just set the option to “Delete data in the master date range before exporting” and you’ll never end up with duplicates in your table. No SQL required! While our connector is still in beta, you can now experience the power of the Google Analytics Reporting API v4. Query for Cohorts, pivot results before importing them to Canvas, get up to 9 dimensions and 10 metrics per query, receive a higher sampling threshold for Analytics 360 accounts, and more! If you’re an existing user of Analytics Canvas, simply uninstall your current version through the Windows Control Panel, then download and install the latest version. All of your settings and authorizations will remain in-tact. If you’re new to Analytics Canvas, sign-up to get your full featured, 30 day free trial. It even includes Cloud Automation! We’re here to help you get started with Canvas or with any of the new features. Email support@analyticscanvas.com with your questions or use our meeting planner to request a support call.